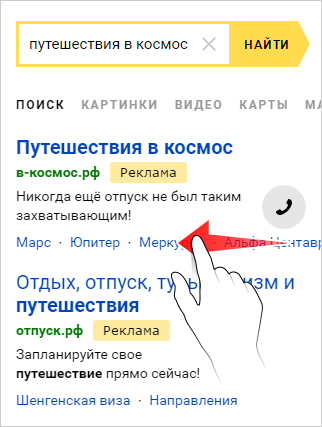 Yandex.Direct ads are shown both on desktops (desktop computers and laptops), tablets, and on phones (mobile phones and smartphones). You can enhance your advertising campaigns with ads for mobile devices with separate advertising text and landing pages. If your campaign contains both mobile and regular ads, then the system will give preference to mobile ads when they are served on phones and regular ads when they are served on computers and tablets. 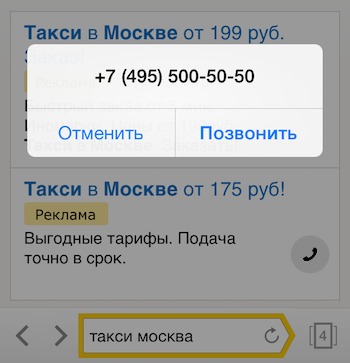 Even if the user is on the regular version of Yandex on their mobile phone, the mobile bid rate will apply for impressions. Ads served on computers and tablets use the same settings and prices are used, but prices for mobile ads (on mobile phones) can be adjusted separately. When ads are served on the ad networks (YAN and ad exchanges), the ads may be enhanced with images if the settings of the ad platform where the ads are served allows it. An effective mobile ad contains a concise and clear text which is easy to read on a mobile phone screen. You can add up to four sitelinks that lead to pages of the advertised site. If sitelink texts do not fit in the line, a horizontal scroll bar will appear. If you add a vCard to your ads, users will be able to quickly get in touch with you. To make a call, just click on the telephone icon . When creating a new ad, check the Mobile ad box and the system will give priority to this ad to be displayed on mobile phones. It is important that the ad group contains not only mobile ads, but also “regular” ads. Then the system will distribute the traffic between them correctly: the mobile ads will be displayed on mobile phones and the regular ads on all other devices. If you only create mobile ads in a group, they will also display on desktops and the CTR forecast for desktops will be taken into account. Likewise, if the group does not contain a special mobile ad, your “regular” ads will display on mobile devices and the CTR forecast for mobile will be taken into account. You can experiment with the bid ratio to get the required number of click-throughs from mobile phones. It is impossible to completely disable impressions on one type of device. Only new ads can be designated as mobile ads. You can not change the ad type later.